The Canadian Rockies are perfect for both road biking and mountain biking. On-road cyclists will appreciate the wide shoulders on all main highways, while those on mountain bikes will enjoy the many designated trails. 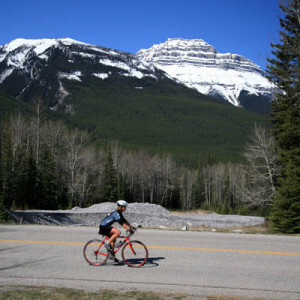 One of the most popular paved routes is the Legacy Trail between Banff and Canmore, which links up with the Bow Valley Parkway to Lake Louise. The most challenging and scenic on-road route is the 290-kilometer (180-mile) Icefields Parkway between Lake Louise and Jasper (Outside magazine rates it as one of North America’s 10 best). Most cyclists allow 4 to 5 days, but it’s easy to spend a lot longer on the parkway. With 11 campgrounds, 4 hostels, and 4 lodges along the way, you’ll have plenty of accommodation options. An extension of the Icefields Parkway is the Bow Valley Parkway, the original route between Banff and Lake Louise, which can easily be cycled in one day. Backroads (510/527-1555 or 800/462-2848, www.backroads.com) offers a wide variety of trips through the Canadian Rockies. These trips are designed to suit all levels of fitness and all budgets. An average of six hours is spent cycling each day, but there’s also always the option of riding in the support van. The cost, inclusive of luxury accommodations, is US$3,850. Mountain biking is allowed on designated trails throughout the national parks. Park information centers hand out brochures detailing these trails and giving them ratings. The Canmore Nordic Centre is home to 70 kilometers (43.5 miles) of biking trails, some steep enough to hold international downhill competitions each summer. Peter Oprsal’s Bow Valley Mountain Bike Trail Guide covers all the major trails in the Bow Valley; pick up a copy from local bookstores. Bikes can be rented throughout the national parks and Kananaskis Country. Road and town bikes rent for $6 to $9 per hour and $25 to $35 per day. All shops rent front- and full-suspension bikes; expect to pay up to $20 per hour and $70 per day for these.